Create Something Universal… or Niche? 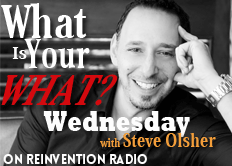 Steve tells of how his New York Times Bestselling book, “What Is Your WHAT? Discover The One Amazing Thing You Were Born To Do” has been translated into multiple languages, most recently Turkish. His book and teachings are truly universal and serves a broad spectrum audience. His question to the RR Crew is then… do you think you need to niche and serve a subset of the population or can you stay general?